Would you like to embed YouTube videos into your page-flipping book? 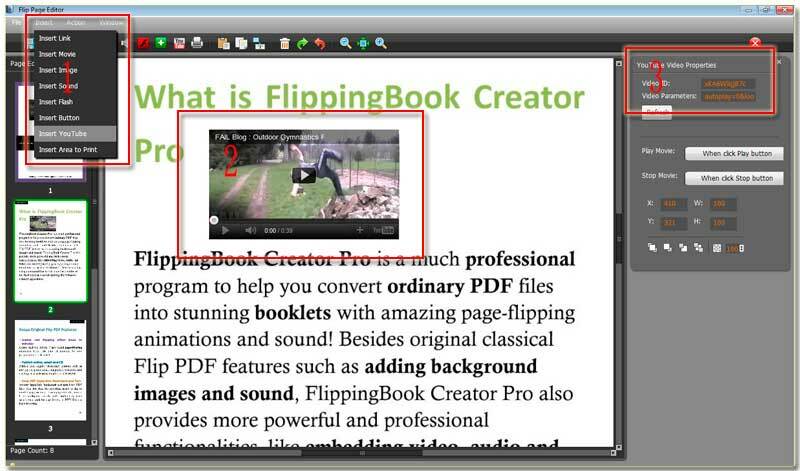 Step1: Launch FlipBook Creator Professional, and import a PDF file. Step2: Click “Edit Page” to step into the flipping page editing interface. Step3: Click “Insert --> Insert YouTube”, and then circle an area on any page. Now please turn your eye to the right edit window, what you should do is paste the video ID in the first form. In the following “Video Parameters” form, you can self-define some parameters to control the YouTube video properties. More details, you can refer to http://code.google.com/apis/youtube/player_parameters.html?playerVersion=AS3. There is still one thing I must prompt you that due to security reason of the computer, sometimes, some people would encounter a problem that after embed Youtube video and then return to the preview interface, it can’t runs normally. But they will encounter a crash. Don’t worry about it, only you should install the flashplayer_10_ax_debug.exe or higher version. Then you can preview the YouTube smoothly. In fact, this problem you will encounter only comes up in your local environment, after upload the output page-flipping files online, it will disappear.